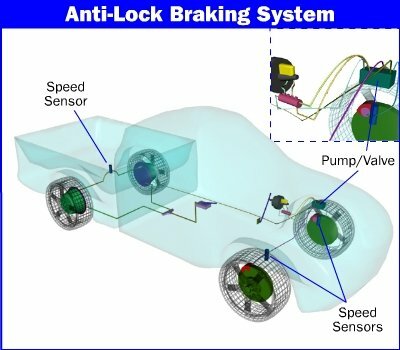 Anti-lock brake systems are designed to minimize and control wheel lock up during braking. Wheel lock, also known as wheel slippage, can have a dramatic affect on the control of the vehicle during braking. Wheels that are locked up, with the tires sliding across the road surface, cannot be controlled by the vehicle operator. The driver is just along for the ride until wheel slippage is reduced to a point where vehicle control is regained. Braking performance is also affected by wheel slippage. The effectiveness of the automotive braking system depends on the ability of the tires to grip the road surface. When the wheels are locked up during braking, the friction for braking is generated by the tires sliding on the pavement, not between the brake pads and the rotor surface. The heat generated during such an event is dissipated very poorly by the tires. The brake linings and the rotor or drum surfaces are much better suited to dissipate the heat generated by friction. Rolling tires with good road surface adhesion when coupled with an efficient brake system, will provide the best stopping performance for a vehicle. The ABS system is able to monitor the slippage of the individual wheels during stops and control the braking of any or all wheels that may lock up. The control module determines wheel slippage by monitoring wheel speed sensor information while braking. A wheel that is exhibiting noticeably slower speeds than the other wheels, would be considered locked up and be selected for brake lock up control. Wheel lock up control is accomplished by modulation of the brake pressure, to the affected wheel or wheels. The ABS control module is a microprocessor that is used to manage the operation of the ABS system. The ABS control module monitors and processes information from various sensors, modulates pressure to the brake system and carries out self-diagnostic tasks. Some of the inputs to the ABS module are the wheel speed sensors, brake switch, brake warning light, parking brake switch, pressure modulation devices and ignition and power feeds. The output controls consist of brake pressure modulation components and the anti-lock brake lamp. Most ABS control modules have the ability to run self diagnostic tasks and store trouble codes for failed diagnostics. The ABS control module can display this information to a scan tool or through flash codes, via the dash mounted anti-lock brake light, making troubleshooting and repair more accessible. Some ABS control modules store sensor information when a failed diagnostic is recorded. This can assist automotive technicians in diagnosing ABS trouble codes by displaying a record of sensor information at the time of the failed diagnostic. Wheel speed sensors are used by the ABS control module to monitor wheel lock up. Wheel speed sensors consist of a toothed wheel, mounted on the wheel hub or axle shaft, so as to rotate when the wheel is in motion. A magnetic sensor is placed at a fixed location, a calibrated distance from the toothed wheel. The air gap between the toothed wheel and the magnetic sensor is usually around .040 to .060 in (refer to your auto repair book for the exact spec). When the tooth wheel rotates past the magnet on the sensor, an AC voltage is produced. The AC voltage output of the wheel speed sensor increases as the wheel speed increases. The ABS control module monitors this voltage to calculate wheel speed for ABS operation. If the ABS control module senses lower voltage from one sensor during braking, it will translate that as slower speed at that wheel and modulate brake pressure to control brake lock up. Brake lock up control is accomplished by rapidly applying and releasing the brakes of the affected wheel. To achieve this, the ABS control module is able to modulate brake hydraulic pressure to individual wheels. Brake pressure modulation is attained through several different methods. Design of the pressure modulation system varies according to vehicle design. One type of brake pressure modulator system uses solenoid operated valves to control brake pressure to individual wheels. The solenoids and valve arrangements are able to increase, hold or release brake hydraulic pressure to the brake system of a wheel. This system incorporates a hydraulic fluid pump to return fluid to the master cylinder and an accumulator to store excess brake fluid. When ABS operation is demanded, the control module operates the solenoid valves to hold or release pressure to one or all of the wheels, to control wheel lock up. A more recent design (and simpler to troubleshoot) uses high speed electric motors to seat and unseat hydraulic valves to control brake pressure during ABS stops. The electric motors are able to cycle the pressure modulation valves many times per second, to control wheel lock up. This design is less expensive to produce, since it does not require a hydraulic pump and accumulator as opposed to earlier designs. The ABS warning light operation is managed by the ABS control module. It is located in or near the instrument cluster and is used to warn the vehicle operator of a malfunction in the ABS system. In the event of a failure in the ABS system, the ABS warning lamp is illuminated to warn the driver. Some systems will inhibit ABS operation when the ABS lamp is illuminated. Refer to a manufacturer’s manual covering your particular year/make/model automobile for the diagnostic and troubleshooting details before embarking on an auto repair project involving the ABS system. 2 Comments on "Anti Lock Brakes"
what was the first year for antilock brakes, Model? do all antilock brakes have to have a abs pump? can the abs pump be eliminated? what years? do any antilock hubs, calipers interchange?